We were always living BY THE WATER! We were always facing the WEST – hence SUNSET became the most necessary prop in all my emotional interludes at all stages of my life! The previous article had ruminated on Kolkata & the Ganges [Living by the water with sunset as prop – Part 1]. Colombo became my second home as we nestled down in the high-security residential area of Colombo 5. Hailing from Kolkata and with no ambition to venture out of Kolkata, initially I had blocked my mind completely to liking this beautiful city. But gradually, as I made new friends who were all Srilankans, I woke up and jump-started my new life in Colombo. Way back in 1998 – the time when we were in Srilanka, the country was still war-stricken. Every now and then I would wake up from my afternoon sleep as a bomb shattered through the railway station one day or the Town-hall, next to our bungalow, the next day. Soon we got used to them as if they were some minor hiccups during our meal times! Carrying our own passports to go to the grocery had become as normal as carrying the credit cards and the home keys. We would stop at check-points where young lads wearing army uniforms would check the car – boot or scan our bodies for explosives. Soon we got used to these ‘halts’ too as if they were speed-breakers while driving! Life can be as easy or as difficult as one wants it to be. At that point of time – I was too young and unfazed to make life seem more complicated than getting up early on a Sunday morning. Nothing seemed unnatural. We would go to the Galle facade over the weekends, watch the sunset – unfazed by the fact that we were the only people walking by the facade amidst army patrol. The horizon and the calm waters seemed to soothe this warring island-nation all around. Most of the families we knew were affected by the ongoing war at that time. Only time and the incessant sea-waves healed their bitter war-memories and transported them back to the present. The Galle Face calmed my emotions when I felt lonely and home-sick and longed to go back to Kolkata. It reminded of my escapades to the Ganges at various emotional outbursts in my life. The Galle Face also helped me to fall in love with Colombo and I very soon started finding solace in the calm waters of the Indian Ocean. But the beauty of the ocean lay only if we could make ourselves oblivious to the check-points and security thronging the place! Almost 12 years after we had left Colombo, we re-traced our nostalgia and went back to show our two little girls where we used to live. We took them to the most beautiful house we had ever stayed in our lives (all the houses that we built our homes in, always and eventually turned beautiful, but this house was indeed the most beautiful house!). We were staying in Taj Samudra on the Galle face – something that was still terrifying in 1998. In January 1996, a terrorist bomb brought down a huge section of the Central Bank building, killing 100 people and destroying Hotel Galadari and the Central Business district which was very near the hotel. Hence, this entire area was almost a deserted no-entry zone. I have been telling the girls how we used to roam around amidst massive security. However I was so glad that they couldn’t visualise anything of that now. Apart from the slight anxiety they were feeling every time we went through the strict security-checks as we entered our hotel since Srilanka was hosting the Cricket World Cup and all the cricketers were packed in the same hotel as us! I would zoom in my camera to take a shot of the sunset – only to find cannons (they are called cannons, right?) pointing at me from a naval warship. They were guarding the cricketers staying in the hotel, I was told! It was absolutely amazing to be strolling on the Galle Face without having to show our passports or without any restriction. Even the sunset seemed free of any tension. Thousands of kites thronged the dusky sky. 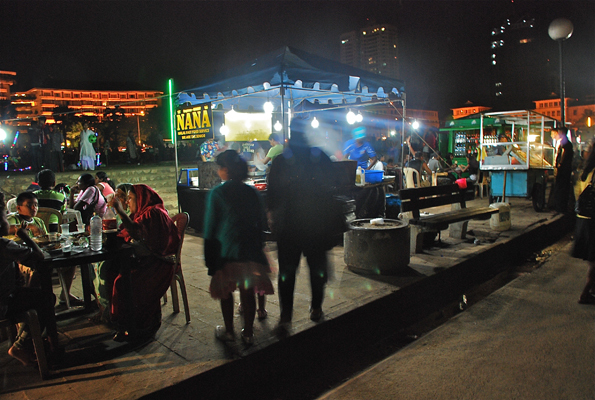 Galle Face Green, immediately south of the Fort*, is a long, thin park which fills up with food stalls on weekend evenings and is a popular meeting place for local people. A narrow arm of Beira Lake separates this district from Slave Island, actually a peninsula where the Dutch imprisoned slaves from their Asian colonies. Galle Road, Colombo’s long seafront boulevard, runs south from Calle Face Green, eventually becoming the main coastal road to Galle and the south. It’s always crowded with traffic and has some of the best shopping and a number of-important buildings, including the official residence of Sri Lanka’s premier, the US Embassy, the British High Commission and some of the city’s top hotels. 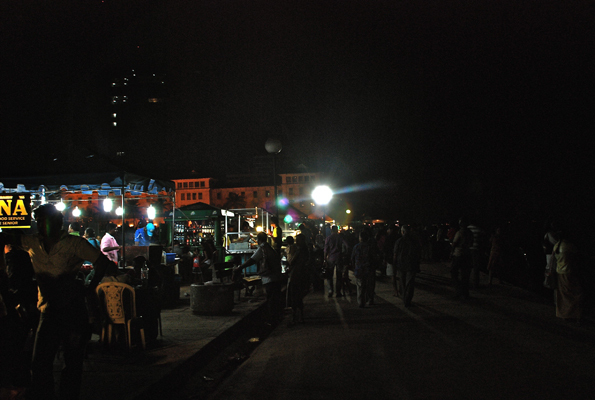 As the night set in, the stalls began to be thronged by people. Crabs, prawns, fish, meat – everything seemed to be smeared with chilli – even the sliced pineapples! We were jostling amidst the crowd, ogling at anyone eating the spiced savories. Our little girls are absolute foodies but definitely not used to such hot ‘delicacies’! Hence we couldn’t sneak in without them. We still haven’t gotten over the fact that we didn’t experiment with such ingenious savouries on this Srilankan journey of our ours. One point that has remained unchecked in my ‘Things-to-do’ List in Colombo. Maybe this calls for the third visit to re-trace the nostalgia of the second one! *[The Fort, between Colombo Harbour to the north and the murky urban lagoon of Beira Lake to the south, is the heart of Colombo. The Portuguese built and extended their fortress here during more than a century of conquest and resistance. It was taken over by the Dutch, and finally demolished by the British after they completed their conquest of the country in the mid-19th century. Today, the area is the city’s financial and commercial heart and houses Colombo’s main international hotels, as well as Sri Lanka’s seat of government. Diya – you know my fascination for beauty – hence! Hello loved this post. Why dont you write an entry on SriLankan food?